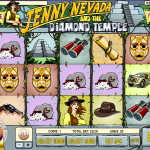 It is a classic Rival slots developed in 2011 and has 5 reels and 20 paylines. The animation and graphics are very nice and really takes you deep in the jungle. Hurry up, the treasures are waiting! 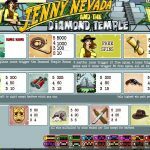 Jenny Nevada has some nice bonus features. First, the Wild Symbol is the Whip and it will replace any symbol on the reels (except the scatters) to form a winning combination. 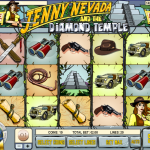 The scatter symbols are Jenny Nevada and the Biplane. 3, 4 or 5 Jenny’s appearing anywhere on the reels will award you 10, 20 and 50 free spins respectively while multiplying your winnings by up to 4x. Getting 3 or more Biplanes will trigger the Bonus Round where you will get to search for treasure in each room of the Diamond Temple. Try not to land a booby trap because that’s how your bonus round will end. Rival Gaming do these cartoon-style slots quite well and this is good fun. It doesn’t seem too tough to trigger both of the features which is always good news and once you’ve turned the sound off you should enjoy this game. Prefer something less adventurous? Try playing Cream Of The Crop a 5 reel slot by Rival.